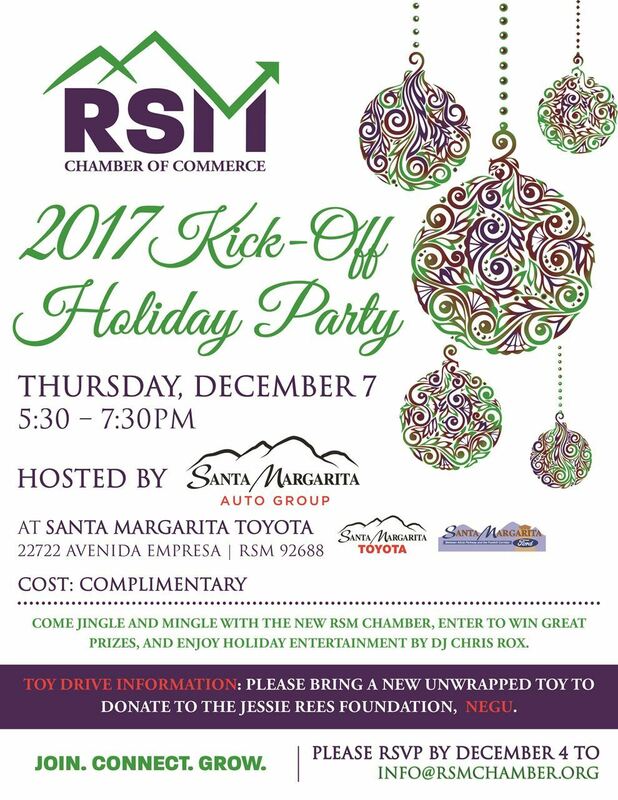 RSM Chamber - Kick-Off Holiday Party! It is with great pleasure to announce that Rancho Santa Margarita has formed a new Chamber of Commerce. Its mission is to promote and enhance the business community of Rancho Santa Margarita by assisting its members through Joining, Connecting, and Growing a vibrant local economy. Thursday, December 7, hosted by Santa Margarita Toyota from 5:30-7:30PM, in the RSM business Park at 22722 Avenida Empresa. This Holiday Party kicks off the new RSM Chamber of Commerce’s membership drive. Come and mingle with RSM Chamber members and learn about our plans for this new, member-oriented and vital support organization for the RSM business community. Take advantage of our Introductory Membership package through December 31, 2017 at the special rate of $99 for one year (plus a one-time $25 administrative fee). Special guests at our Holiday Party will include local elected officials from the City of RSM and representatives of our County, State and Federal governments. To RSVP, email the chamber at info@rsmchamber.com, or visit rsmchamber.org. This event promises to be a great opportunity to meet with fellow Chamber members and get to know new members while enjoying great food and libations to celebrate this holiday season and RSM’s new Chamber of Commerce and active business community.